As a freshman at Michigan State University, I helped the coordinating committee for the international movement Take Back the Night put on the annual event on our campus. In 2012 and 2013, I co-coordinated the event. Each year, we aim to educate survivors, co-survivors (loved ones of survivors), and the public about sexual and relationship violence through workshops, activities, resource tables, displays, a SpeakOut, march, and a candlelight vigil. The international organization's website (click on the photo to the left) is a wonderful resource for the Lansing area committee to look through. Different areas of the country have different types of events, and the survivor stories page is amazingly inspiring. I look at the website at least once a week to lift my spirits, learn how to make our local event better, or just learn more about sexual and relationship violence. 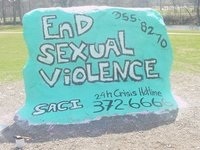 I am a peer educator for the SACI team with the Sexual Assault Program on campus. This means I help put together presentations and educate Resident Mentors, freshmen, university classes, church groups, and more about sexual violence, consent, mental health, and resources.